The onset of winters and the nip in the late evening air invariably reminds me of puff pastry. When I wash my hands after dinner, the icy cold water tells me it is a good time to try a new recipe for it! I have made this recipe by Alice Medrich a few times and loved it. This time I wanted to try an easier recipe and to my delight came across this really simple one which the Daring Bakers had baked last year. Winter, ruefully, was almost gone by the time I finally got around to making it. Michel Roux will be shocked and disapprove as I made it in temperatures which he says is sauna for puff pastry! Well, just until we install that AC in the kitchen! Was happy nonetheless with the outcome considering how easy it is! Surely am going to be making this recipe quite often, winter or not. 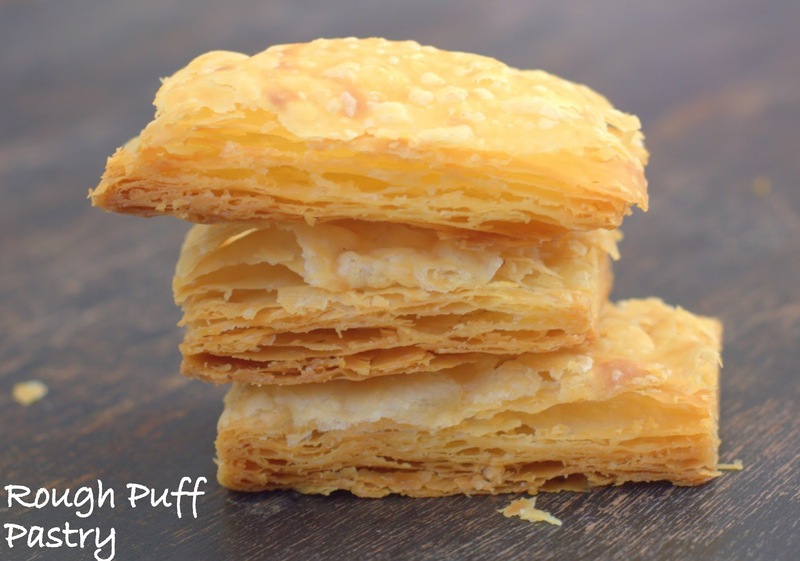 Classic puff pastry of course is quite an involved and lengthy process, rough puff is much easier. Particularly in this recipe, the small quantity makes it easier to roll and fold and generally makes it easier to handle the pastry. 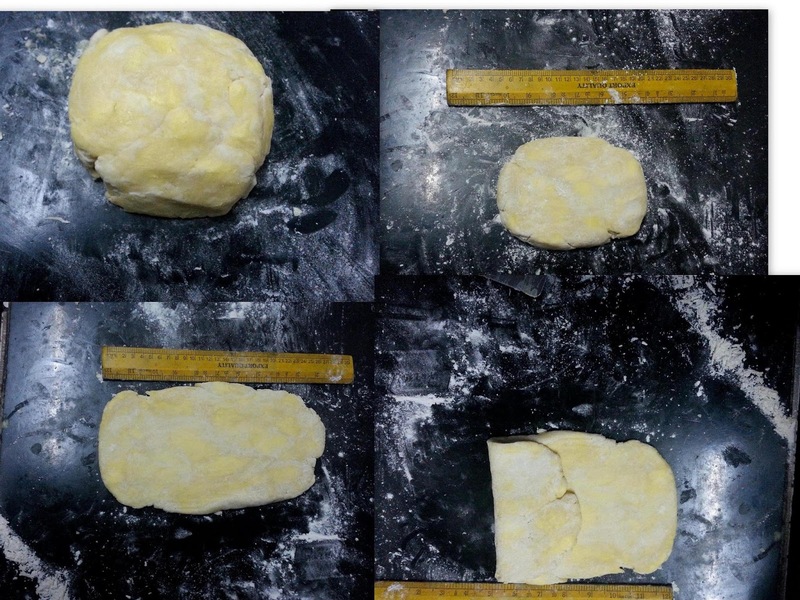 If the quantity is large, the dough needs to be rolled into longer dimensions, slightly tricky to handle, more chances of tearing the dough. Here the cold butter is simply cut into the flour - as you would for a pie crust. And then the dough is given a few turns after chilling in between. And the results are not bad at all! So if you have never made puff pastry, here is the perfect recipe to start with! The post is going to be lengthy again (yawn!) but details do make a great deal of difference. So please so read very carefully and follow the recipe to the T. Practice of course goes a long way in perfecting these techniques and these are just my baby steps into making puff pastry. Here is sharing what I have gathered so far. The post is lengthy, but the method is simple as you will realize! Be sure to plan well ahead. Weigh all ingredients including water. Do not attempt a whole wheat pastry, all purpose flour is best to start with. Make this in a very cool kitchen - preferably late evening. You do not want your gas stove or oven on as it will make the kitchen warmer. 2 hours plus overnight chilling. Hands on time 10-15 minutes. Cake lifter (in the image below) or anything large and flat with a fairly sharp edge. A silicon brush for brushing excess flour on the pastry. The butter must be very, very cold and firm, but not frozen solid. Sift the flour and the salt, chill airtight in the fridge. Cut the butter (the size of the cubes is important), weigh and then chill it. Do not chill and then weigh just before making the pastry, the butter will go soft. Weigh water and keep it in the freezer. You want it very, very cold. Keep two tablespoons cold water in another glass in case you need more water. Take a printout of the recipe, you won't be able to navigate screens with messy hands. Remember - at any point while making the pastry, if your butter goes very soft, you can refrigerate it till the butter firms up again. Make sure your counter is clean and dry. Do not keep any other liquids on the counter. Then dump the rest of the butter on top of the flour. Toss them into the flour, coating them with the flour. Now using the metal bench scraper, cut the butter into the flour so that the butter is cut into smaller pieces, the size of a large peas approximately. If in doubt, err on the side of the pieces being larger than smaller. Get that 50 grams of water from the fridge, pour it into the well. Using the fork or the scraper mix till the all the flour is moistened. Do not worry if it still looks kind of dry, it will come together. Adding excess water can make the pastry tough. Carefully, sprinkle a teaspoon or less of the extra cold water if needed if the dough is extremely dry. The amount of water may vary depending on humidity. As long as your pastry comes out crisp and light, the quantity of water should not be a concern. 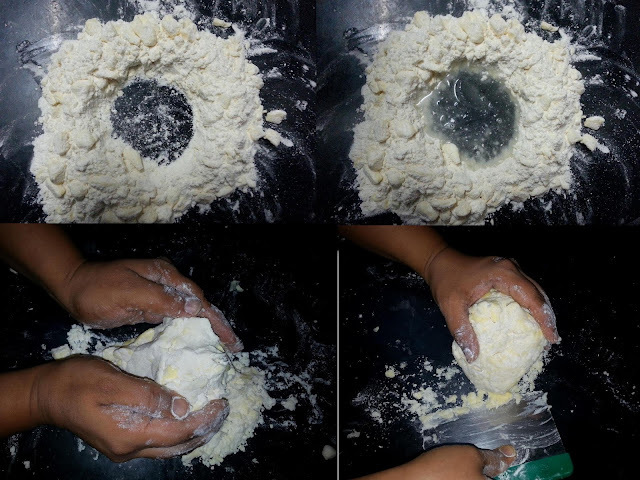 Very gently, knead or squeeze the dough a couple of times, just enough to bring it together to make a rough block.Do not over work the flour. It will be looking very rough at this point, with the butter pieces clearly visible. Flatten and wrap the square in cling film and refrigerate 20 minutes. Do not refrigerate too long or the pastry will be too firm to roll. Every time before you get the dough back from the fridge for rolling, scrape the counter and rolling pin clean, lightly flour the counter. Place the ruler on the counter, roll the pastry with very gentle pressure - 10 inches long and 5 inches wide. Lift it using the cake lifter, turn gently now and then, so that it does not stick to the counter. Brush excess flour using the silicon brush. Fold it into thirds like a letter as shown in the image. Place on the cake lifter, wrap in clingfilm and refrigerate for 20 minutes again. This is the first turn. 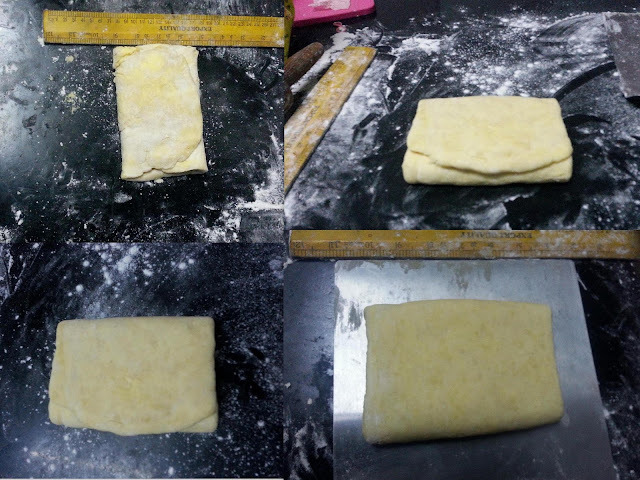 With the the short side facing you, roll the pastry into a 10'' x 5'' rectangle again. Brush excess flour. Fold into a letter, wrap and refrigerate again for 20 minutes. This will be the second turn. Repeat till you do 6 turns, refrigerating in between for 20 minutes. Each time you roll, the pastry will look less rough. If it is warm, a bit of butter may ooze out as you roll, that should not be totally disastrous. After the 6th turn, roll the pastry into a 10'' square, wrap tightly in cling film and refrigerate overnight. The pastry will be firm after refrigerating overnight. Cut as much as you need, take the needed portion, wrap in cling film and leave on the counter for 10-15 minutes or longer (if the weather is very cold) The dough must be soft enough to roll with just gentle pressure. If you roll with more pressure, the layers you have created with care will get glued together and your pastry will not be flaky and light. Once the dough is soft, roll with very gentle pressure on a lightly floured area into 3-4 mm thick sheets. Cut into desired shapes and again refrigerate 30 minutes (or freeze for sometime till firm). The butter will firm up again and give you a more flaky pastry. Bake at 180 C for 25-30 minutes or till the pastry is golden and crisp. Serve warm. This is important. You can fill the rolled pastry, refrigerate and bake. The baked pastry can be refrigerated for 2 of days airtight or frozen wrapped airtight for a month or so. Reheat in the microwave before serving. Always serve warm as the butter will solidify as it cools, that will actually taste terrible. The unbaked pastry can be double wrapped in cling film and frozen for a month. Thaw still wrapped, overnight in the refrigerator before using. Please note : I have tried this pastry 3 times. 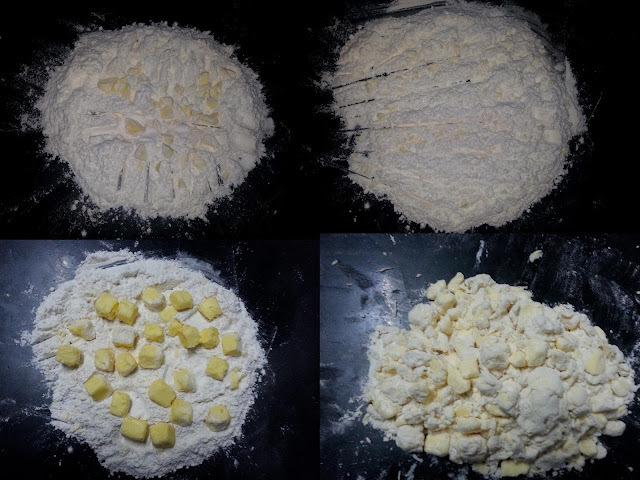 Once I cut only 25 grams butter into the flour, the rest I have just tossed into the flour and brought it together (without cutting it in, the rest of the method remains the same) this works well too, but the pastry may be slightly more difficult to roll. This gave me lighter and flakier pastry (the first image at the beginning of the post). Try the cutting in (all the butter) method first and then experiment with the other method. I will stick to cutting in only 25 grams and mix in the rest. 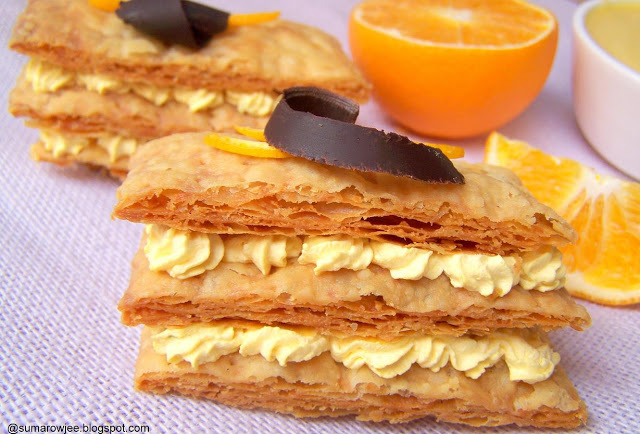 Or try this delicious dessert - Orange whipped curd sandwiched between layers of flaky pastry. Recipe here. 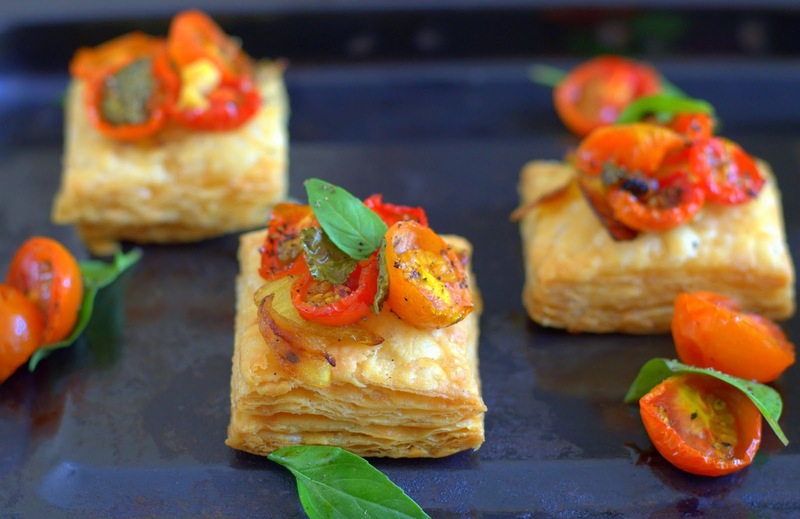 You will discover more recipes as you go, but this one makes the perfect first puff pastry recipe to try! Do not give up if your pastry doesn't turn out as expected the first time. You will get better with practice. Certainly a very useful and super versatile basic recipe to have in your repertoire. I will keep updating this post as I make it again and again. Please do leave your comments for me, would love to hear from you! Please follow my page on Facebook for updates on new videos for beginners in baking, every Monday! Click here to subscribe to my You Tube Channel Baking For Beginners. This looks doable and I will give it a try. The pictures of the final product is definitely an incentive. You have done the post with so much of details. Puff pastry is there in my to do from a long time. but I am too nervous to give it a try. Will give this a try before it becomes too hot and difficult to handle the dough. You are a girl after my own "engineering" heart, scale and all. I absolutely love this detailed post which makes it fail-proof! 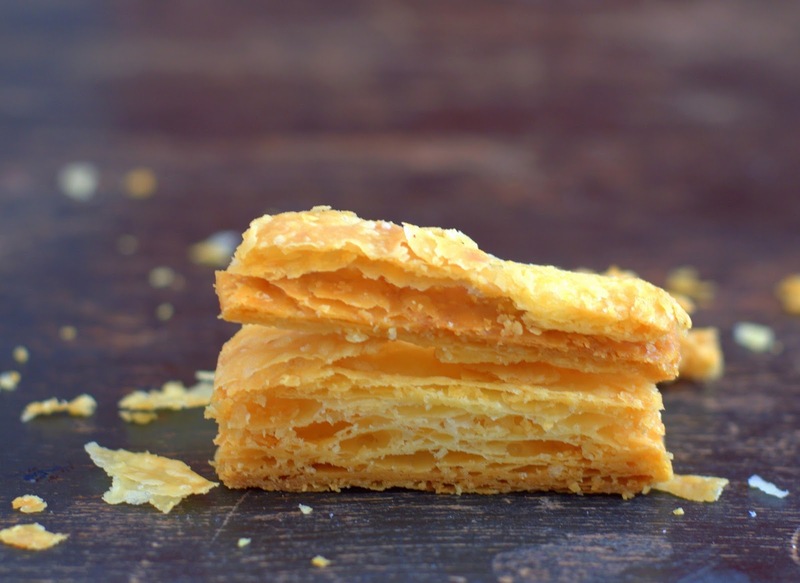 Puff pastry snaps are great! Your guidance is simply superb!